In September 1942, a large number of people were deported from the Lodz (Litzmannstadt) ghetto to the Chelmno (Kulmhof) death camp. On September 1-2, 1942, the Gestapo and the police violently removed 2,000 patients, including 400 children, from all of the hospitals in the ghetto. At the same time, the Jüdischer Ordnungsdienst (Jewish ghetto police) and the Sonderkommando (a kind of ghetto political police) sealed off the streets. 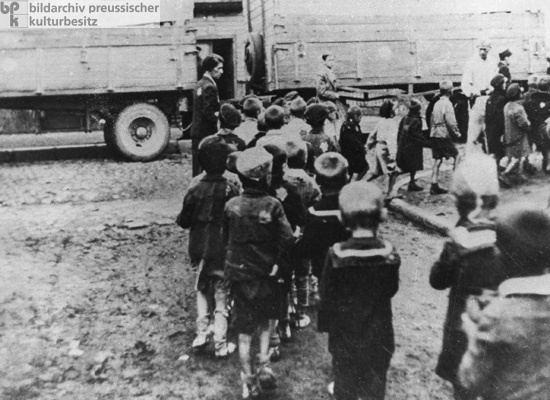 After the hospitals were evacuated, the Nazis ordered the deportation of an additional 20,000 Jews, including all children under ten and all ghetto inhabitants over 65. On September 4, Chaim Rumkowksi, Chairman of the Jewish Council of Lodz, delivered a speech to an audience of around 1,500. Breaking down in tears, he asked audience members to hand over their children – an action that would allegedly save the lives of the rest of the ghetto population. Between September 5 and 12, a general curfew was imposed in Lodz (called an Allegemeine Gehsperre or simply Sperre in German). During this period, the Gestapo and the police carried out selections and deportations with the help of the security service and the Sonderkommando. Jews who attempted to escape or offered resistance (often mothers wanting to save their children) were shot on the spot. According to Gestapo figures and the Lodz ghetto chronicle, 15,700 inhabitants of the Lodz ghetto were deported to Chelmno between September 1 and 12, 1942.